It’s another Mascot Monday and I’m feeling a little slow. It’s been a long weekend and I’m just trying to catch up to things. Some would even say I’d be feeling a bit sluggish. Never fear, for even in mascot-dom there’s a wacky character that can inspire the lethargy deep inside all of us. 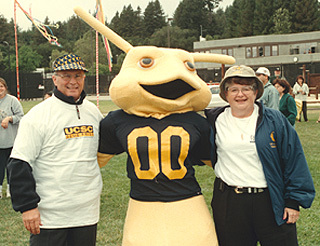 I’m of course referring to this week’s featured mascot, the UC Santa Cruz Banana Slug! 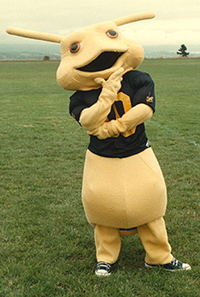 A relatively young mascot, this yellow buggah has already made waves within the mascot world. In 1981, UC Santa Cruz got tired of being all book smart and nerdy and decided they should try on sports out a couple of years. According to the Wikipedia entry, the chancellor deemed the school the “Sea Lions” and brought fear to all those who would challenge. The students hated it and opted for the more fearful banana slug. The chancellor balked and said the jocks could name the mascot. Little did he know that the jocks were really book nerds too and he watched them take a bath in the irony. So today, we have the UC Santa Cruz Banana Slug. It seems irony is the key facet of a banana slug, especially in California. According to the official mascot history, Reader’s Digest name them the best college mascot in 2004 and the tennis team’s shirt at the NCAA Championships read “Banana Slugs – No Known Predators.” So I guess the geeky joke continues on in the form of random web-stick poking, including KCCGD and Mascot Monday. And really, if it’s a banana slug, why do they also call it the Fiat Slug? The only Fiat I know of are crappy Italian car makers. Is this a part of the ruse played on the jocks across the world, or is it some inside joke that only alumni know of? Like a banana hand shake? Now I’ve had plenty of those and UC Santa Cruz isn’t what I’m thinking about while I’m shaking either. I guess the mystery will live on. 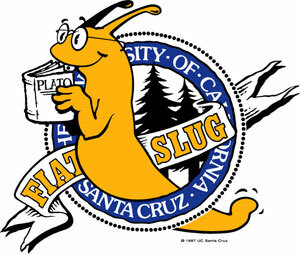 And that’s what makes the UC Santa Cruz Banana Slug so endearing. There’s something going on there, but we can’t put our finger on it. Our curiosity compells us to pay attention to the Fiat Slug and pull apart its intricacy laid before us. Meanwhile, a 6’3″ junior blows by us as she drops a duece for an easy lay up. Well played UC Santa Cruz Banana Slug. I don’t know what the hell you are, but distracting me from the game makes you a great mascot and you made it to Mascot Monday.